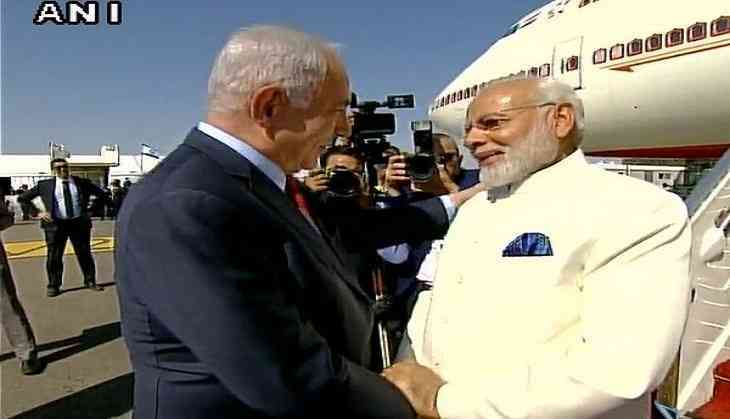 Indian Prime Minister Narendra Modi on Tuesday arrived at the Ben Gurion Airport in Tel Aviv where he was received by his Israeli counterpart Benjamin Netanyahu. Prime Minister Modi is the first Indian prime minister to visit Israel. His program for the day includes him visiting a technological centre. From there he will head to Yad Vashem, the national Holocaust memorial in Jerusalem accompanied with the Israeli leader. Tomorrow, the Indian leader will meet with Israeli President Reuven Rivlin, hold talks with Prime Minister Netanyahu and then attend an event organised by the Indian community in Israel in Tel Aviv. On Thursday, Modi along with his Israeli counterpart, will visit Haifa cemetery, the cemetery of the fallen Indian soldiers in the first world war and place wreath on the grave areas. From there, the duo will head for a field visit to see the Gal Mobile-integrated water purification vehicle designed to produce high quality drinking water. It can be used during times of disasters to provide drinking water.